We bought out the chimps, downsized their stupid trees, and then fired their lazy asses. I love being able to fire chimps, don’t you? You can’t blame us for outcompeting the Australopithemitts, we all ran out of chimps. Ok, not homo, just pretty-mouthed. I’m not gonna apologize for my wealth. And since wealth requires poor people to work for it, I’m not going to apologize for anyone’s poverty either. Next stop: Romneybots vs. Mittdroids in the Giant Waste of Galactic Resources in Pointless Pursuit of Galactic Dominance Over Resources! 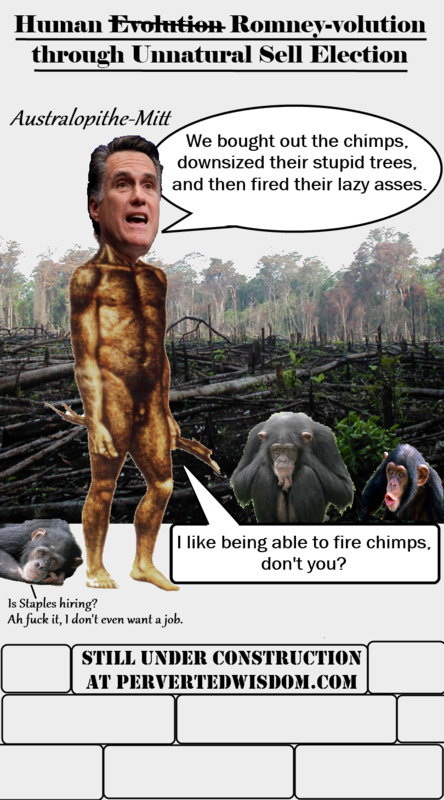 This entry was posted in cultural criticism, entertainment writing, humor, news, philosophy, politics, religion, Uncategorized and tagged election 2012, Human evolution Romney-style, republican primaries, Romney evolves, sean hannity by Alan Brech. Bookmark the permalink.